A loss in the championship of my women’s volleyball league plus crying and a jerk on “The Bachelorette” so it calls for a beer. 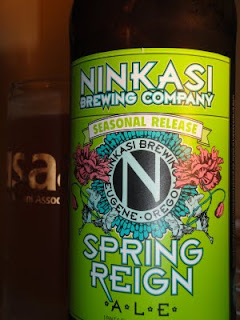 I chose the 1pint 6oz bottle of Ninkasi Spring Reign that’s been hanging out in my fridge. Popping the bottle and dumping it into a frosty ASU mug might have been the highlight of my night -- well winning in the quarters and advancing to the finals might have been better but that was squashed by the loss in the finals. To me this seasonal release is a little deceiving at first glance. The bright green label with pink and blue highlights make me think it’s a weak “I play for fun kind of player” but like some of the women you encounter on the other side of the net, you don’t always know what you’re going to get from the outside. The first taste is crisp and fresh -- typical of a spring seasonal. It reminds me of the average height woman who you think probably played a little high school volleyball but isn’t that intimidating. Like that player you taste ‘Spring Reign’ and think “oh, that’s tasty but nothing special” when all of a sudden it hits you -- just as that women takes a swing and drops a kill right in front of your face and you haven’t even taken a step to try to dig it. Just as you’re swallowing the first sip the hops creep up and overwhelm your taste buds, making that spring seasonal something with a little more than you might have expected. 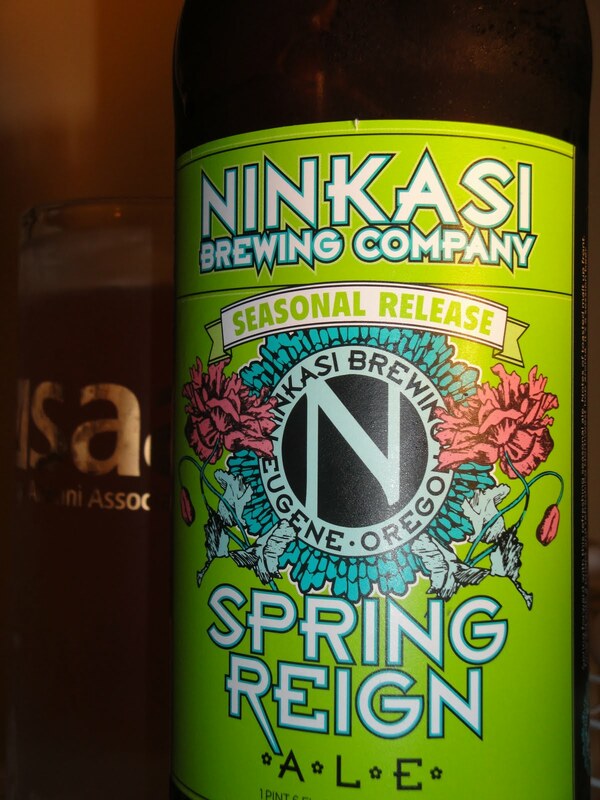 While the bottle might be a little deceiving if you know the Ninkasi Brewing Company they put a little bit of pop of in each of their brews. I look forward to trying this seasonal on tap and to getting a few more digs to help the team to victory next season.